I always wonder how critical infrastructure systems can get paralyzed during a catastrophic event. This week, in the case of Mumbai, unprecendented rains caused the city to come to a standstill. At least 87 people were killed in two days of crippling rains and another 130 were feared buried in landslides, according to authorities and news reports. Troops were deployed after the sudden rains - measuring up to 94.4 centimeters (37.1 inches) in one day in suburban Mumbai, the capital of Maharashtra state - stranded tens of thousands of people. "Most places in India don't receive this kind of rainfall in a year. This is the highest ever recorded in India's history," R.V. Sharma, director of the meteorological department in Mumbai, told The Associated Press. I heard some personal stories over the phone. You can read one account from Amit Varma, and another from Sonia Faleiro. In another account, Rashmi Bansal claims that parts of the main city floated, but the suburbs sank because city officials chose to protect ministers and high-profile people living in south Mumbai at the cost of inconveniencing suburban folks. This is a rather unsatisfactory explanation. The main point is how different infrastructure systems including drainage, power, telephones, transportation collapsed in a short amount of time. This type of a failure goes beyond a simple cascading system failure. Not only did individual systems fail, but failure of one system affected other systems and causing them to fail as well. Due to sudden heavy downpour, the City's drainage system was overwhelmed. According to some reports, the city officials decided to lock the gates of the stormwater drainage system because they feared that sea water during the high tide would enter the city (sorry, link is in Marathi). 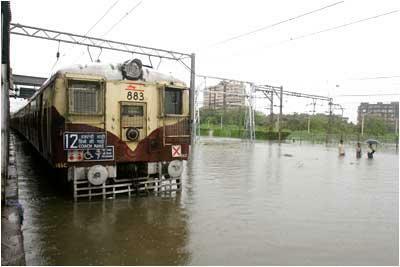 With water flooding different parts of the city, road and train systems shut down (via Indianwriting). In due course, all transportation means of getting in or out of Bombay were effectively been shut, including the airport. Power supply in suburban Bombay had to be shut down for the fears of short circuiting, although it may have been disrupted due to faults in local interconnections at different places. Much of the cell phone networkes were overwhelmed as a large number of customers tried to place calls, causing an outage. While the main city was sufferring, Reuters and BBC reported that a fire had broken out on one of the offshore oil platforms of Bombay High. It was not clear initially if the torrential rains played a part in this accident, but Reuters reported that an oil rig collided with the platform, and the weather had everything to do with it. There were about 400 people on the platform, of which 271 have been evacuated 348 have been safely evacuated, but rescue operations were hampered due to rough weather. This accident effectively takes out 80,000-100,000 barrels per day of oil supply out of the markets for months to come. Think about how a large terrorist operation might be able to cripple a city for days or weeks, and how will you counter that threat. Will that be different from countering dramatic changes in weather or catastrophic climate change? How might you want to modify the current Risk Assessment and Vulnerability Analysis as well as Mumbai Disaster Management Plan to better respond to the situation? UPDATE (08/31): Over the weekend, several bloggers have come together to put together information about last week's massive rains and the current situation in Bombay. This is one example of how blogs are continuing to contribute towards independent reporting and dissemination of information in real time. You might remember the fantastic job SEA-EAT blog has been doing. In the case of Cloudburst Mumbai, much more real time and first hand information is becoming available. BBC is running a six part series titled "Planet Under Pressure". The third chapter focusses on Energy, and is called Powering the planet. (Actually they call it Energy Crisis). Not all of it is entirely accurate. Take for example the example of hydrogen powered buses. It is, however, a very good attempt at educating the public about energy. I might add that WBCSD's Facts and Trends Report to 2050 on Energy and Climate Change is an exceptionally well made booklet. The first time I heard about a company going Carbon-Neutral was on SAM's website. SAM of course is Sustainable Asset Management, which produced one of my favorite reports. I kind of dismissed what I saw in SAM's carbon neutral report. Then, a couple of weeks ago, WSJ published an article on how it is becoming hip to be Carbon-Neutral. I found out that the makers of TechPolicy's favorite movie, The Day After Tomorrow, have also gone carbon-neutral. Both SAM and The Day After Tomorrow have chosen Future Forests as their partner in becoming Carbon-Neutral. Your flight will cover 15476 Miles and produce 6136.84 pounds of CO2. Planting your trees will cost $44.84 and you will receive a certificate, info about your chosen forest, and a CarbonNeutral baggage tag. A Carbon-Neutral baggage tag for $45? That will add an additional 3% on my travel costs. Am I ready to go that far to be Carbon-Neutral? UPDATE (07/18/05): Joel Makower points to carbon neutral driving, but I am going to focus on air travel. Check out MyClimate.org.